The wisdom teeth, or third molars, are the last set of permanent teeth to erupt. Unfortunately, they do not always grow in normally. In many cases, they can become trapped within the jawbone, either partially or completely. This is referred to as impacted wisdom teeth. These complications can lead to an array of more serious dental issues if the condition is left untreated. Fortunately, at our Rancho Penasquitos, CA, practice, our doctors offer tooth extraction for patients suffering from third molar impaction. Some individuals are lucky enough to never develop wisdom teeth. Others may have one, two, three, or all four present. Occasionally, third molars will erupt in a normal position and integrate well with the bite. In the majority of cases, however, they will need to be removed to promote optimal long-term oral health. When wisdom teeth are impacted, they can place excessive force on the adjacent teeth. This can lead to dental pain, shifting, and mobility. When a wisdom tooth is partially impacted – that is, part of the crown is above the gums, and the rest is trapped below – it can easily harbor bacteria and infection, leading to issues with decay and gum disease. 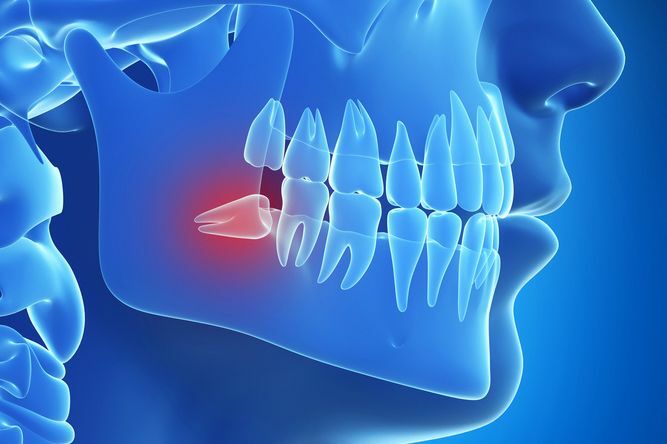 If you think you may be experiencing symptoms of impacted wisdom teeth, it is important to schedule an appointment with your dentist as soon as possible. In order to properly diagnose your condition, an x-ray will be taken. Typically, a panoramic radiograph is obtained. This will show all four wisdom teeth and can help your dentist determine their positions. After reviewing your x-rays and performing a thorough dental examination, your doctor will be able to recommend an appropriate treatment plan for you. If your doctor determines that your wisdom teeth are problematic, they will recommend tooth extraction. Depending on your particular situation, all of your wisdom teeth may be removed, or just one or two. Before your procedure, all of your treatment details will be discussed with you, so you know exactly what to expect the day of your surgery. If your tooth is fully erupted, it can be gently lifted from the socket. If it is impacted, your doctor will need to make an incision in the gums to access the tooth, and place stitches to protect the surgical area. Most patients experience minimal pain or discomfort following their wisdom tooth removal. To expedite a speedy and successful recovery, be sure to closely follow the guidelines provided by your doctor. If you are experiencing symptoms of impacted wisdom teeth, we encourage you to visit PQ Family Dental. As always, our team is readily available to answer any questions you may have. During your initial consultation, we can help you determine if this procedure is necessary for your oral health. You can contact us online anytime to schedule your visit.